A fresh outlook for your health & well being! Brand Strategy & Development, Corporate Identity, Stationery Design, Website Development, SEO, DL Fliers, QR Codes, Blog, Facebook Page and Mobile Website. 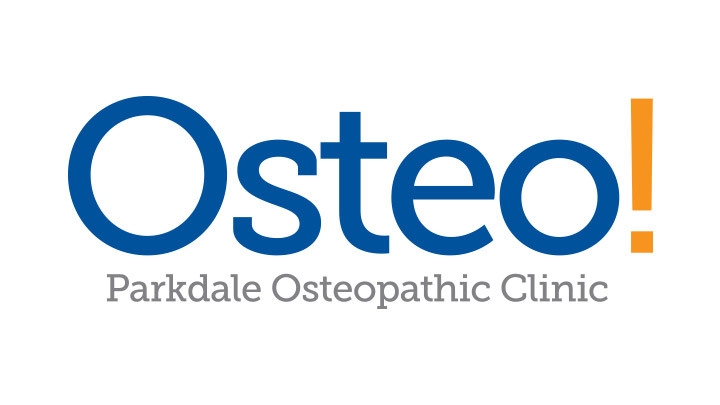 After 10 years in operation it was time for the Parkdale Osteopathic Clinic to revitalize their brand and bring new energy to their identity... they asked Bingo Bango to help. So we did! 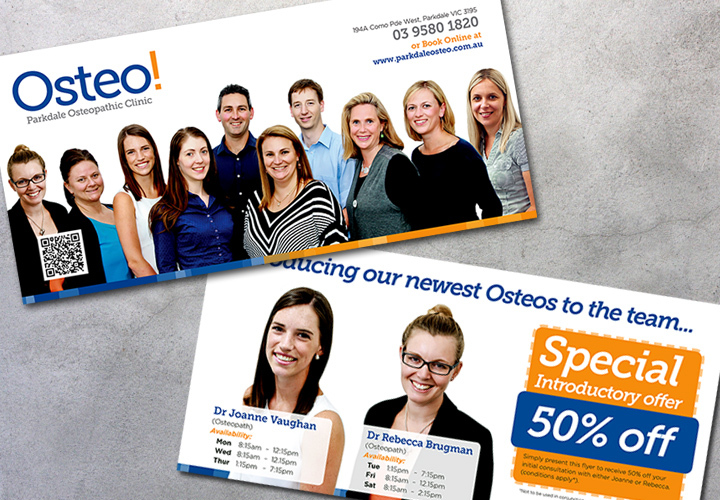 The first part of the process was to devise a new identity for the clinic that was modern and fresh, but more importantly, to develop a brand that was consistent across all media. Live well, See how we can help! 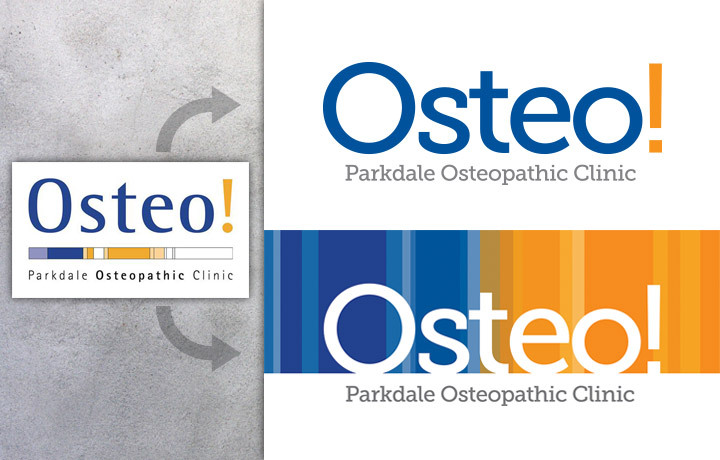 When Parkdale Osteopathic Clinic approached us to help bring new life to their logo and identity, our first brainstorm resulted in the following - let's not reinvent the wheel, but rather, let's enhance what's already there. After 10 years of operation, the clinic had already built up quite a lot of depth in its brand equity through the services it provides. So without wanting to give them a radical new look that could alienate them from existing clients or make it feel like a new company had been set up - we embraced their heritage and focused our strategy on simply enhancing their existing brand. 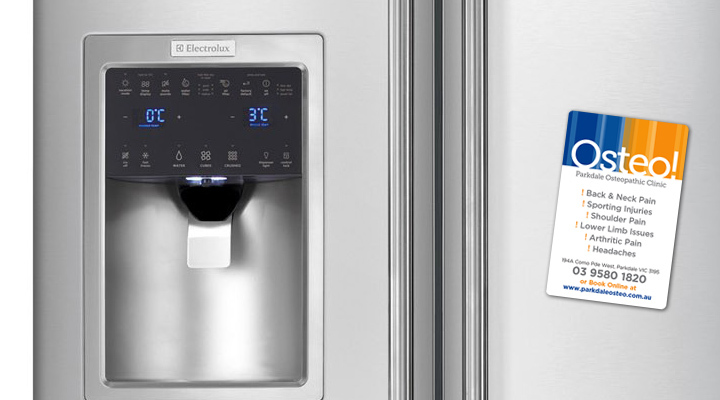 The first part of the project was to modernise their logo. 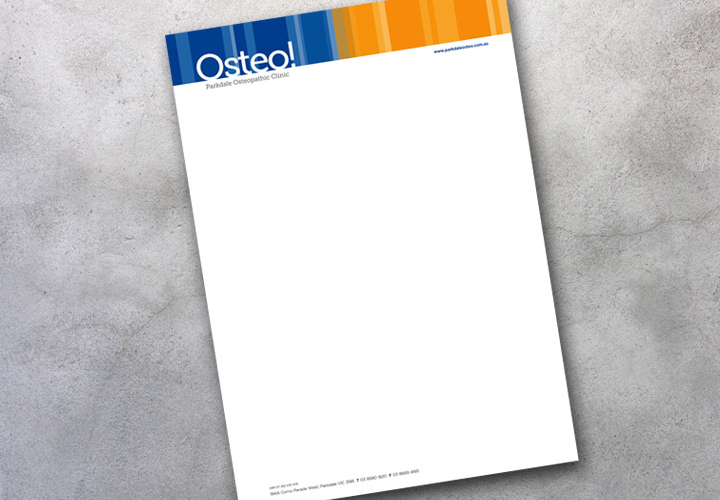 We did this by creating a friendlier, less aggressive, logotype that works in two parts: 1) it is easier to read, 2) it better reflects the true nature of Osteopathy as a non-obtrusive form of remedial and preventative health management. We further enhanced this by extending their original two-tone colour palette whilst keeping the original colours as the main focal point. Following on from their logo redesign we then pushed the identity out to cover all of their communication pieces including Stationery (Business Cards, Letterhead), Promotional fliers and Fridge Magnets. 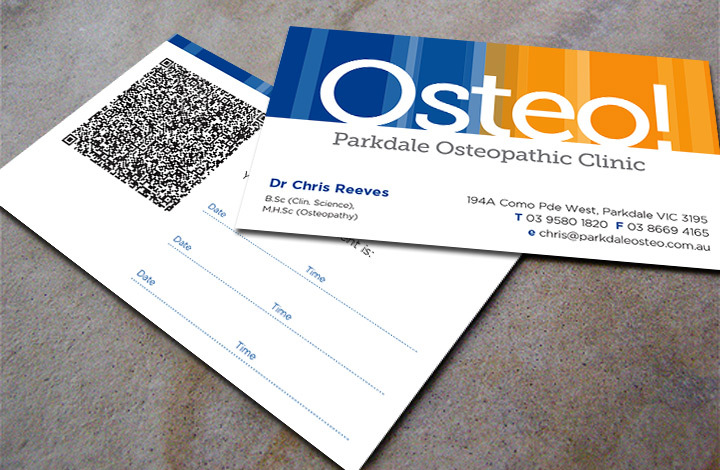 We also utilised QR Codes on the back of the business cards which allows for each Osteo's contact details to be added to a clients contact list via a quick scan on their smart phone. 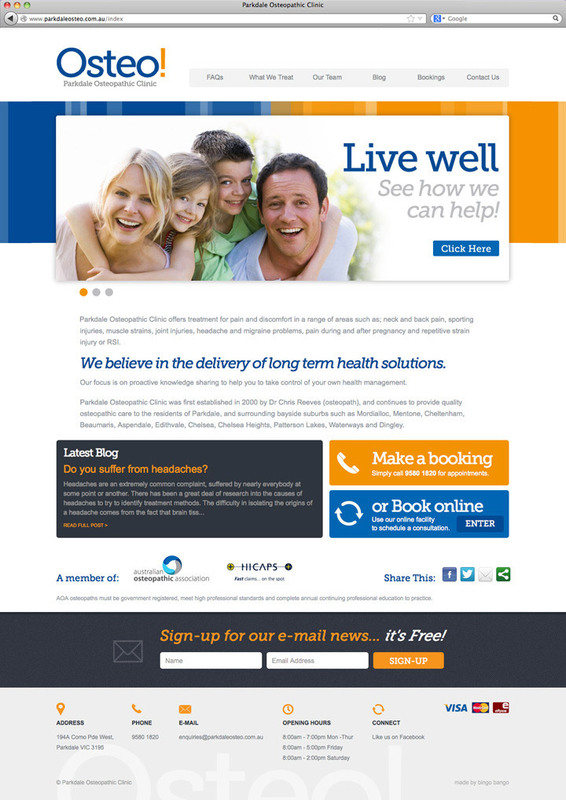 The new website, built with a back-end CMS system from Blackmaze Creative, allows the team at Parkdale Osteo to be able to make regular updates and blog posts, but more importantly allows for clients to book consultations online. 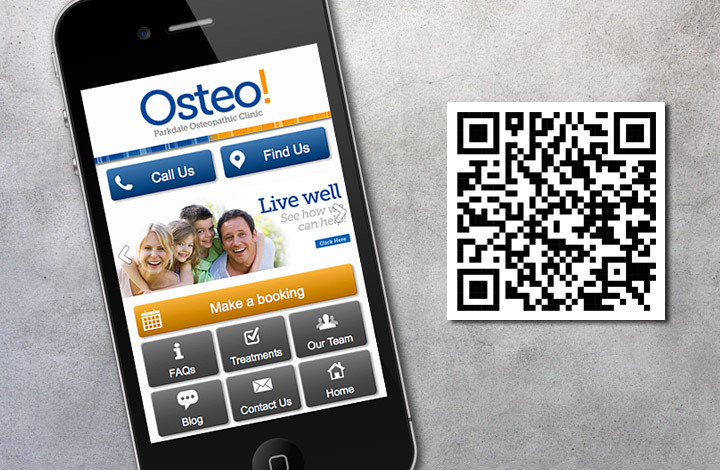 And, we also created a mobile version of their website that has been optimised for use on all smart phones which makes it easier to contact and locate the clinic - literally at the touch of a button.